Virtual Local Area Network are networks those are standardized in IEEE 802.1q and operate on layer 2 of the OSI reference model. Virtual Local Area Network can be implemented with switches that operate at layer 3, thus combining the advantages of switching and routing. Virtual Local Area Network and VLAN has been used in this article interchangeably. For Virtual Local Area Network, IEEE 802.1q provides Ethernet frames, the frame is extended by 4 bytes and packed more information into the header, which govern the exchange of data within the Virtual Local Area Network by tagging. The ToS field (~3 bits) can be set as the priority for the movement of the frame. The change is made by the drivers of the network adapter and evaluated by cross-network Virtual Local Area Network switch. How a Virtual Local Area Network are set up? There are collision domains and broadcast domains in Virtual Local Area Network. These refer to the layer 3 of the OSI model and are implemented with subnets (for Virtual Local Area Network). Subnets generated by the addressing of IP addresses and subnet masks are to be assigned manually or by a DHCP server on the network stations within a Virtual Local Area Network. All stations which are within a subnet and not separated by a unit in layer 3 of OSI model layers are located within a broadcast domain. Most modern Ethernet networks for Virtual Local Area Network are based on the specific topology and can be identified by the switches. These switches in a Virtual Local Area Network, forward the traffic only to the port where it will find the destination MAC address. Within a collision domain there is usually a single station. The establishment of collision domains reduce the data loss caused by collisions during data transmission within a Virtual Local Area Network. This in turn reduces the overall network traffic that is caused by repeated transfers. In Virtual Local Area Network, the routers operate at Layer 3 of the OSI reference model. Routers prevent the transmission of broadcasts in a different subnet. Routers effectively prevent broadcasts within a Virtual Local Area Network. Many routers in a local network have the disadvantage that they cause a lot of network traffic among themselves. Protocols are there to ensure the exchange of routing tables between the routers to each other for a lot of network traffic and unnecessary errors within a Virtual Local Area Network. A solution based on switches have added advantages over pure IP routing. Therefore, Layer 3 switches are used for Virtual Local Area Network, such as routers to create different subnets. The switches are configured so that its ports not only know the MAC address, but are configured on a particular subnet, sometimes even to a specific IP address. This leads to the dissolution of physical structures, which are given by the classical switch. However, larger Virtual Local Area Network may be fast to administer. 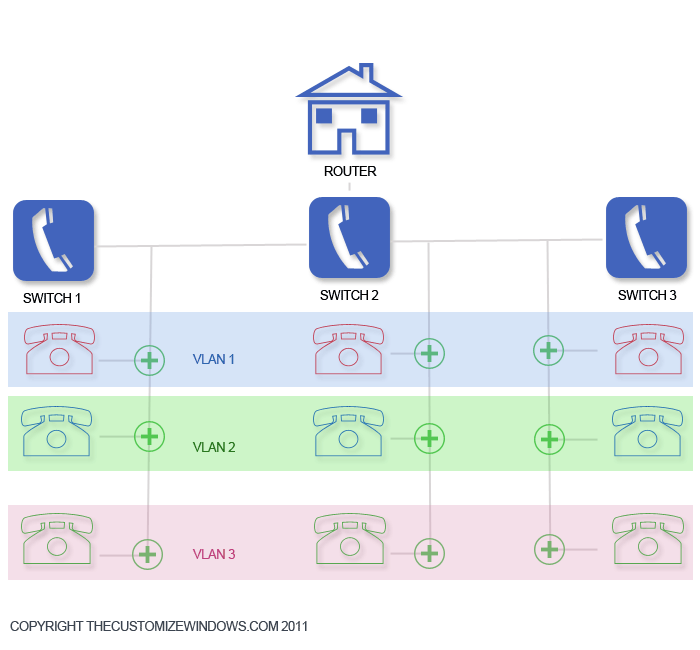 Although the clients of Virtual Local Area Network 1, 2 and 3 are connected to different switches, they are addressed to different subnets. The Layer 3 switches in function of specific subnets on the transmission of broadcasts. If a data packet is switching subnet, it is automatically routed to another Virtual Local Area Network and assigned to the correct station. This article on Virtual Local Area Network is written by Robert C. Morrow ; graphics used for illustration is a intellectual property of The Customize Windows. This Article Has Been Shared 5260 Times! How much of RAM you should have to run your Microsoft Windows 7 PC faster? A general misconception is more the user increases, the performance increases. But why? What is best amount of RAM a Windows 7 user must have? Cite this article as: Abhishek Ghosh, "Virtual Local Area Network (VLAN) : How it Works," in The Customize Windows, November 5, 2011, April 18, 2019, https://thecustomizewindows.com/2011/11/virtual-local-area-network-vlan-or-ieee-802-1q/.